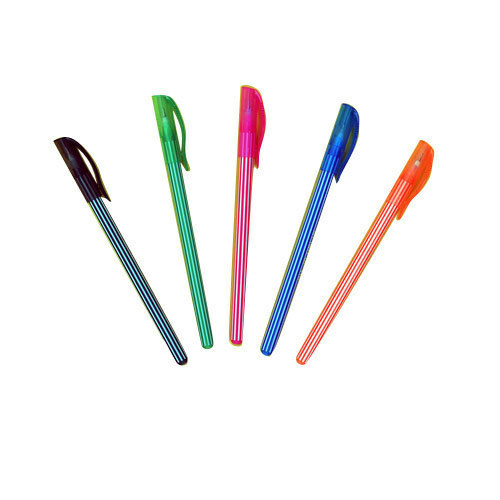 We are engaged in manufacturing and supplying extreme quality Dot Pens that is widely demanded throughout the world and is manufactured with high quality plastic and latest technology ink. We export these Dot Pens in various parts of the world in excellent quality packs at competitive prices. We, "Saraju Agriways Exports Private Limited, Kolkata", established in 1999 are counted as the most renowned manufacturer & exporter of an exclusive range of Ball Pens, Drawing Pen and Direct Filling Ball Pen. Blending innovation with quality, we bring out this fascinating range of pens. This range comprises Ballpoint Pens, Sketch Pens, Writing Ball Pens, Roller Ball Pens, Blue Ball Pens, Gel Pens, Stick Pens, Drawing Pens, Marker Pens, Color Sketch Pens, Drawing Sketch Pens, Writing Gel Pens & Quick Drying Gel Pens. We properly utilize quality materials to offer the products in line with varied quality norms. With comfortable grip these pens are highly acknowledged for tips of different diameters, easy flow of link and smooth writing. These are the major reasons behind the popularity of these pens and wide acceptance in various commercial and corporate establishments. Our sound infrastructure, extensive R&D and dexterous work force are the key factors that have made us to qualify in this competitive market and made a signature of success. Further, we offer customized solutions which also push us to reach to the height of success & recognition. Moreover, due to our transparent business dealings and ethical business practices we have achieved large clientele over Indian Subcontinent, Caribbean, North Africa, East Europe, East Asia, Central America, Middle East and many others.